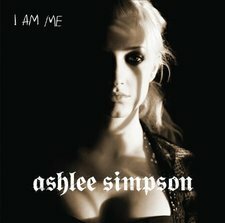 Some of you may remember that I endorsed Ashlee Simpson's debut CD, Autobiography, last summer. Well here I am again, right in the thick of it for round two with I Am Me. Let's begin by defining Ashlee's brand of music as "guilty pleasure." Do I belt out "Boyfriend" as I'm driving to work everyday? Sure. Do I make sure the windows are rolled up so as to not embarrass myself? Absolutely. I always should remind you guys that I don't listen to the radio. I own 7 iPods and have a 6 disk in-dash MP3 CD player in my try-to-be-eco-friendly Ford Focus. I seriously don't have to deal with the static on the radio. I found out about Ashlee's new CD the way I always find out about new albums: I check out the new and future releases page on Amazon. "Boyfriend" then hit iTunes and I listened to a sample. Before I know what I'm doing, I'm downloading the album on the day of release. On first listen, I was severely disappointed. Autobiography had an infectious pop/rock soul while her sophomore offering had too many slow songs, no blatantly obvious genre, and uninspired lyrics: "what ya been doin' / whoa, whoa / haven't seen ya 'round." After a few spins with the disk, it was easy to separate my favorite songs from the bargain basement tracks. "Boyfriend" is so addictive that when I emailed the sample to AJ, he was embarrassed to admit that he liked it. In my car, I always fast forward through tracks two and three, straight to "L.O.V.E.," if only because I love a good tambourine. The song itself doesn't make much sense and is maybe the most out of character song for Simpson, harnessing an almost dance-partish aura while the vocals jump between droning and screaming. But hey, it works for me. My favorite track, "Coming Back For More," is more of an art imitating life lesson for me. This one's very pop/rock-esque, an instant connection to the Ashlee of yore. FFW to "Burning Up." I recalled the story of the first time I heard the song to AJ by telling him that I was into the reggae-ish beat of the song as it first came on and then thinking "what the hell is this crap?" while the refrain echoed in an almost off-key fashion in my head. It grew on me. I don't know about AJ. "I Am Me," the title track of this second release debacle, first plays as a disk one reject: wailing guitar, screaming refrain, whoa-ing to the fade. But like most of the other songs on the CD, a few listens later and you can't get the song out of your head. You even start whoa-ing along to the end of the song. Did I mention that Ashlee is one of my guilty pleasure artists? Sorry for her, the last track of the album may very well be the worst song ever arranged. "Say Goodbye" is obviously a Jessica Simspon reject. The 80s musical arrangement, ethereal backing vocals, and poor Ashlee sounds more like she's got to go to the bathroom than sing this emotional song... I can't believe her record company let her throw this crap together, yeah? But for me, the good kinda outweighs the bad and the CD was a solid purchase for moi. On my wishlist for her next album would be more solid pop/rock anthems. We know her band can play them, we know she can sing them (or do we? ), and we know that it sells. I never want to hear her sing another song that sounds like it was from the 80s. If these conditions can be met, she's got a fan for life in me.